A friend recently purchased an espresso machine and asked me to help teach him how to use it, as he does not know what “good” espresso is supposed to taste like. This got me thinking about how to describe the taste of a properly pulled shot of espresso to someone that has never had one. Let’s talk about orange juice for a second. What does “good” orange juice taste like? Your answer will vary depending on 1) whether or not you even like orange juice and 2) what sort of orange juice you prefer. We figure this out over time and with experience. From concentrate? Not from concentrate? Pulp? No pulp? Specific store brands? Fresh-squeezed? I think most people would agree that fresh-squeezed orange juice tastes the best, but it is also the least convenient (and most cost-prohibitive) of the options, so many of us make do with other options. 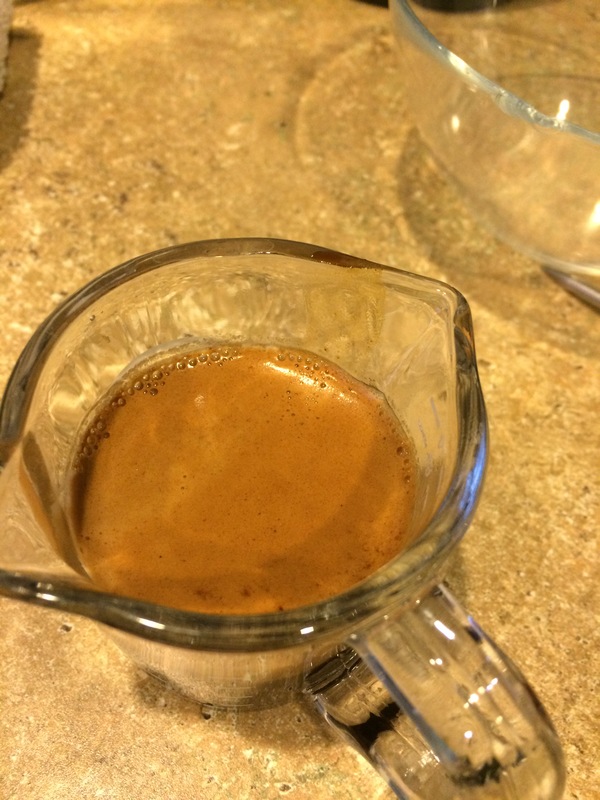 I can definitely say that I had not had the pleasure of a “good” shot of espresso until relatively recently (within the last year or so), and it is the equivalent of fresh-squeezed orange juice: expensive when you have someone else make it for you, and labor-intensive when you make it at home! But, to me, it is so worth it. I am going to be talking about what espresso tastes like when it is “fresh-squeezed” – meaning, what it tastes like at peak flavor and under ideal circumstances. This is something that I learned from experience, both at coffee shops and at my home. I will be the first to admit that “fresh-squeezed” espresso is way more trouble (and expense) than most people are willing to endure, and I don’t judge people that make do with other espresso options, but if you’re curious about what espresso could be, keep reading. What are the components of a “good” shot of espresso? Balanced flavor. A properly pulled shot should be sweet and smooth on the tongue, without any unpleasant sour, bitter, or ashy flavors. The flavor should also linger pleasantly on the palate. Texture. Espresso is thicker in texture than drip coffee. A shot should not be watery in flavor or texture. Crema. There should be a layer of crema on top of the shot (reddish-brown to dark tan in color). The ideal size of an espresso shot can vary but generally there are three standard pulls: ristretto (around 1:1 ratio of ground coffee to water), normale (1:1.5 to 1:2), and lungo (1:2+). Most coffee shops will pull normale shots but you sometimes will find the others as options. 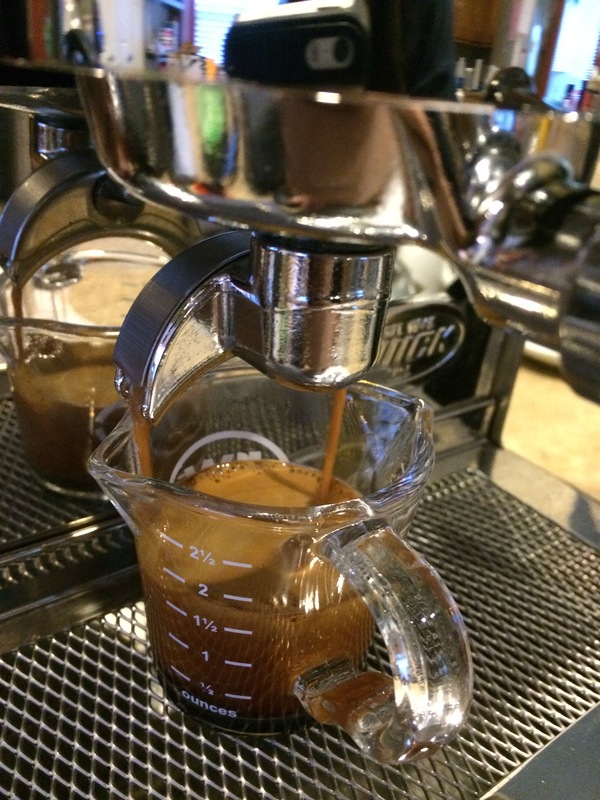 The best espresso is made with freshly roasted coffee beans, but if the bag is too fresh, the beans may be degassing too much to pull a controlled shot. I typically will start pulling shots with a bag of coffee around 5 days post-roast, and continue until the bag is gone or until the crema starts to suffer. Flavor: If you are accustomed to sweet foods, adding sugar to your coffee, etc., an espresso shot may not taste “sweet” to you in the traditional sense, but coffee does have natural sugars in it, and espresso can have a very pleasant sweetness on the palate when pulled a certain way. Sour shots: If your espresso makes your face screw up like you’ve sucked on a lemon, your extraction time might be too short, or your espresso might have been pulled at too low of a temperature. Bitter shots: If your espresso is very bitter, your extraction time might be too long, or the shot was pulled at too high of a temperature. Ashy shots: I most often get shots that taste like cigarette ash if I pull the shot for too long. I’ve unfortunately experienced this at shops as well, but at least now I know what causes that flavor that makes me feel like I’m licking an ashtray! Texture: The pressure created in the machine combined with the small amount of water creates a much thicker brew than typical with drip coffee. Since espresso machines do not use paper filters, the oils are also retained in the shot (and in fact lead to crema production). Regarding texture, I’ve had ristretto shots that are like maple syrup, and normale shots that are closest to heavy cream. 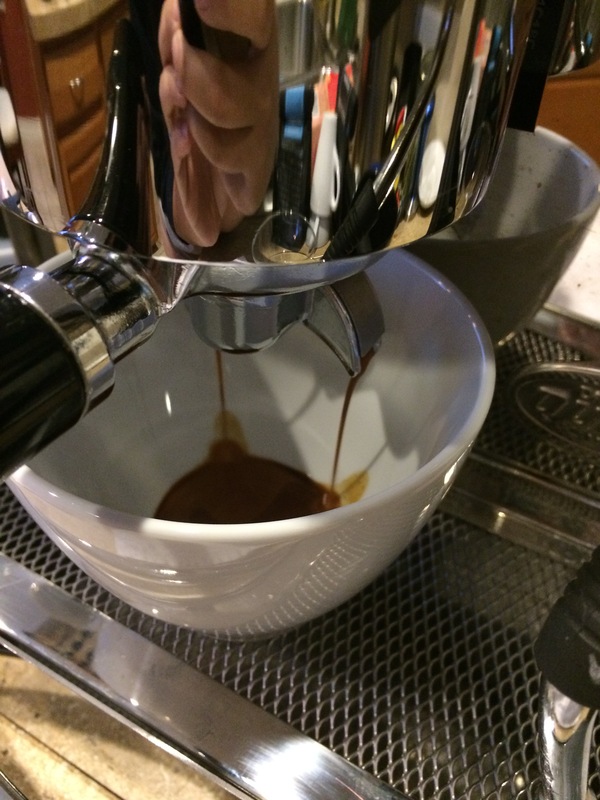 Crema: Crema is the lovely layer of emulsified coffee oils that combine with microbubbles of air to create a layer on top of the rest of the espresso shot. 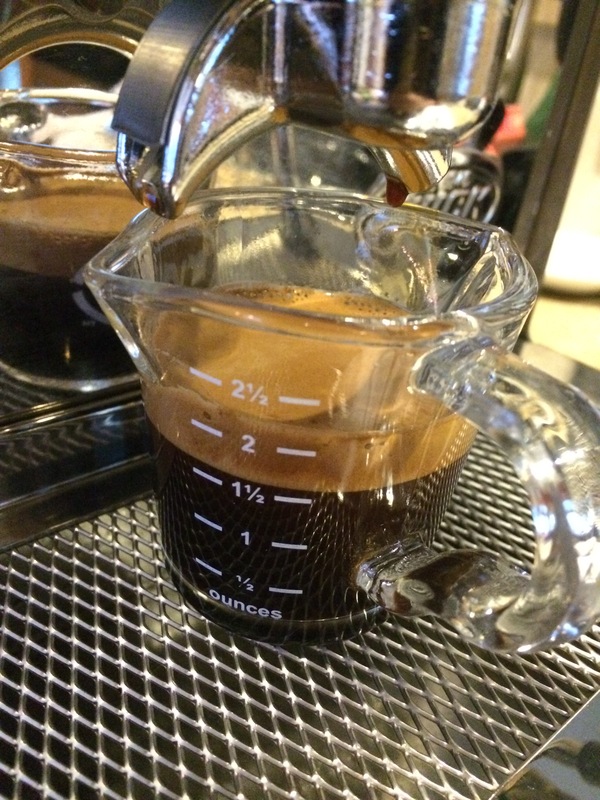 Fresher beans have more potential for crema production, so having a nice layer of crema on the top of a shot is a good indication that your beans are likely to be fresh. The presence of crema does not necessarily guarantee a great shot of espresso, but a lack of crema is a guarantee that a shot will not be great. 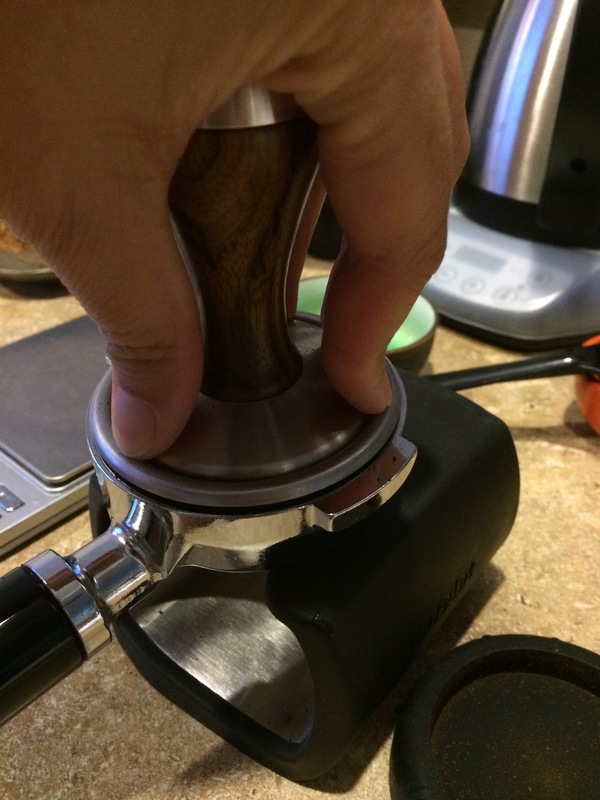 Super-automatic espresso machines and some handheld espresso makers make use of a pressurized portafilter. This aerates the espresso and creates a light tan foam that isn’t real crema, but gives the illusion of crema in appearance, though not in flavor. It lacks the sweetness that is a hallmark of real crema. I also find that a lot of espresso produced from super-auto machines don’t have the same texture as shots from a semi-auto – they taste thinner. Size: This comes down to personal preference, and I admit that I have not experimented much at all with lungos so I really can’t speak with any authority on that topic. However, I feel like most espresso blends are probably designed to work best pulled as normale shots, since that’s what is most commonly served in shops. This is not to say that they can’t work other ways, but when I’m evaluating a bean, I start with a normale ratio and experiment further if I feel like the bean would have potential pulled as a ristretto shot. 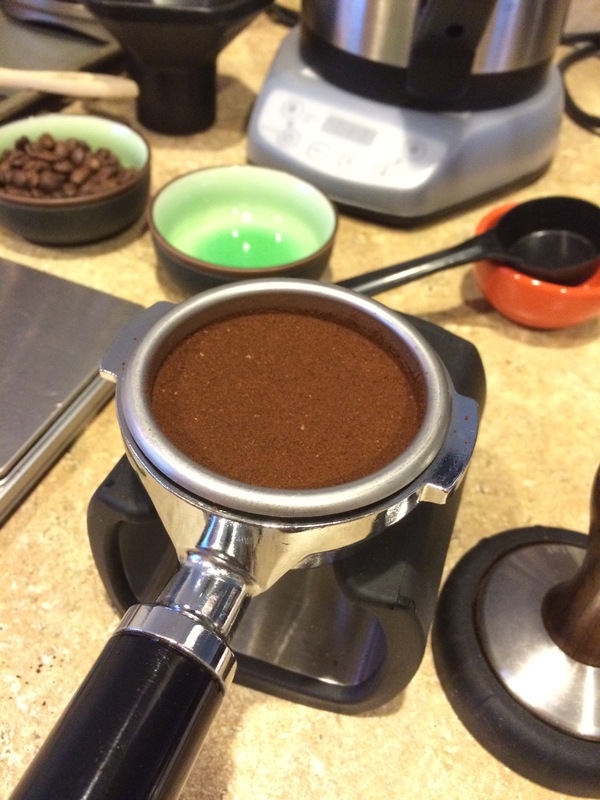 It’s not as simple as using more or less water – I adjust the grind size so as not to get an over- or under-extracted shot. You will sometimes see this list ranked in a different order of importance, but I cribbed this list from a post on the excellent Home Barista forum. It’s a surprise to many people that the espresso machine itself is ranked dead last in importance, as having a skilled hand, a great grinder and top-quality beans are all more important for a great espresso drink. 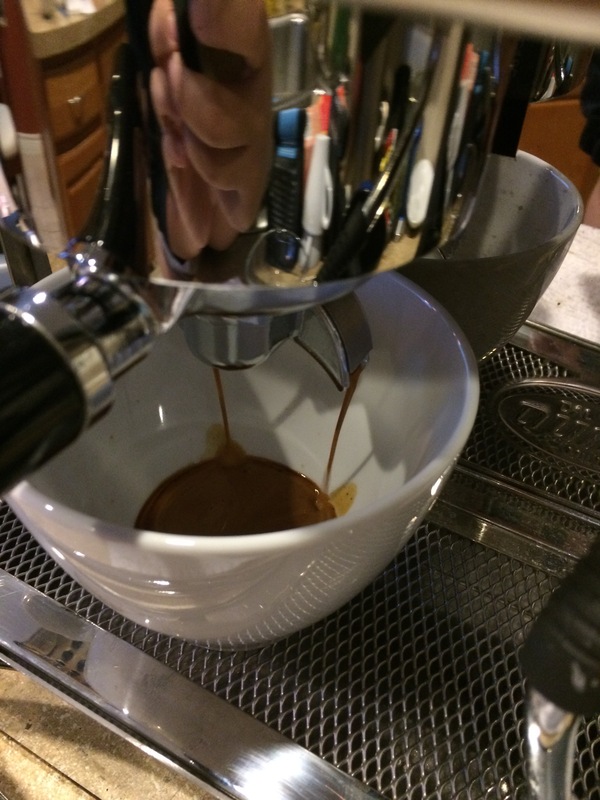 Here are some photos of me pulling an espresso shot made with Sterling Blendo Stupendo. I have found that I usually prefer blends when making espresso because I like the balance of flavors. Many third-wave coffee shops pull single-origin espressos, and while I do like single-origin coffee, the flavor characteristics that make them so individually interesting in a 8-ounce cup often are too much for me when concentrated into just 2 ounces of liquid. The machine: Quick Mill Silvano. Grinding the beans in my Baratza Vario immediately before pulling the shot. Tamping the grounds into an even layer. I really wish I could get a photo that didn’t reflect my hands in the grouphead, but such is life when you have a shiny machine! 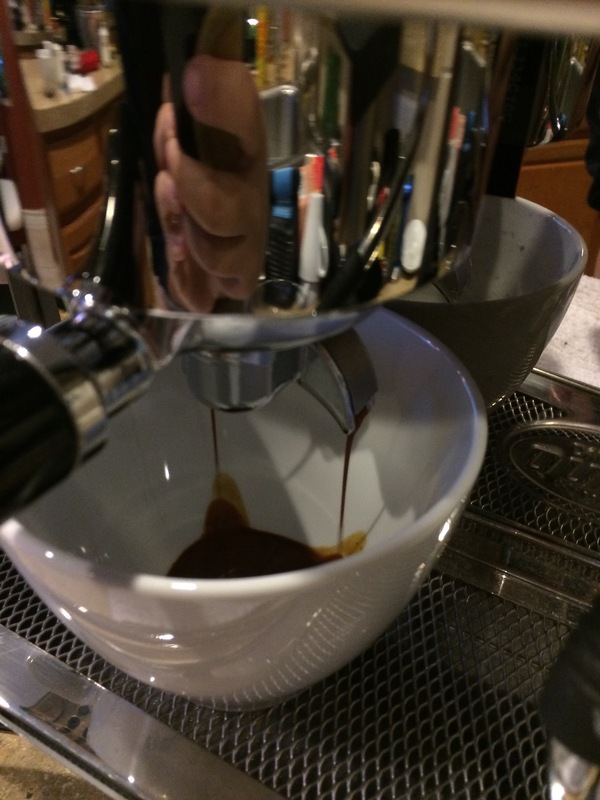 Note the thin streams of very dark liquid pouring at a steady rate from the double-spouted portafilter. I’ve seen these referred to as “rat tails” on coffee forums. This particular shot was destined to become a latte for Shutterbug. As it continues to extract, you’ll notice the flow of liquid gets lighter in color. Baristas take care to cut the extraction just before or at the point of “blonding,” where the best flavor compounds have already been extracted and the color of the liquid turns a very light tan or almost white. 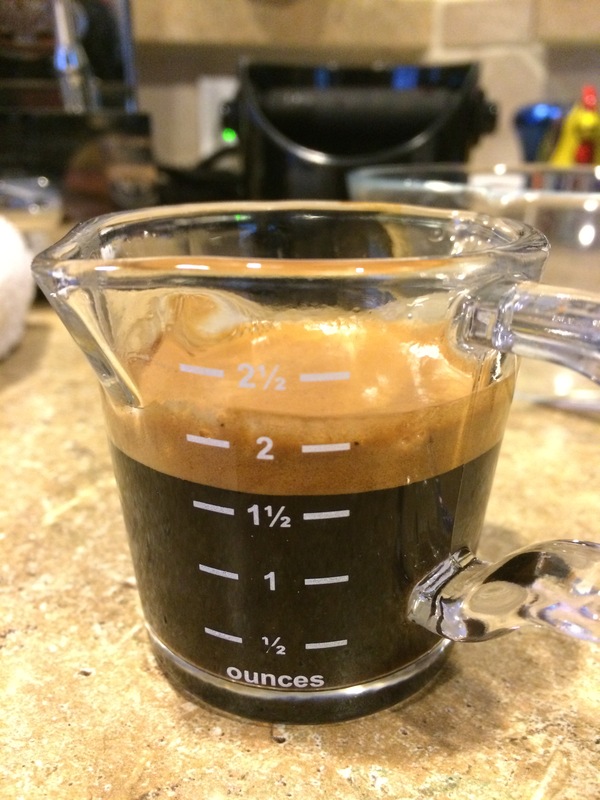 I repeated this same process in my little Rattleware measuring cup so that you could see the layers of the espresso shot. The lighting level was different here because the sides of the latte cup weren’t in the way, so everything looks paler in color (though it wasn’t in real life). 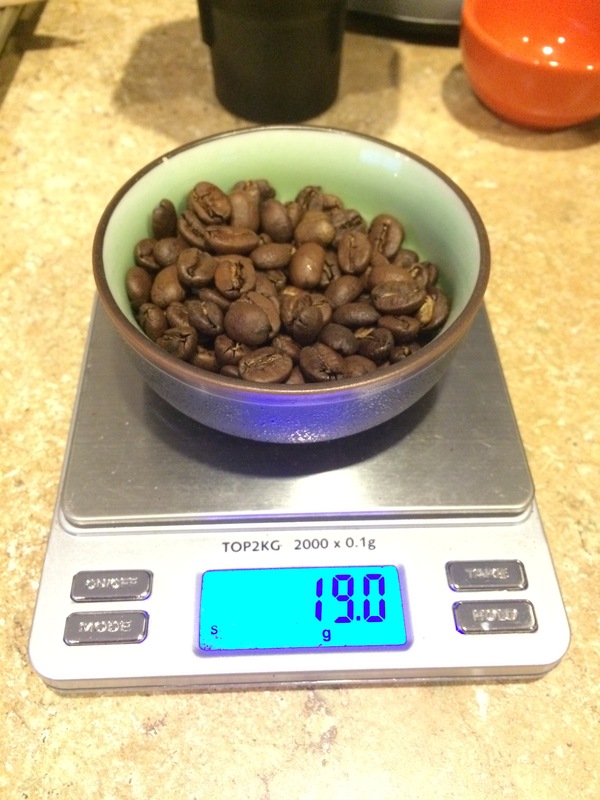 Final product: A normale shot with a nice layer of crema, 10 days post-roast. The lighting makes the crema look rather lighter than it was in real life, but trust me when I say it was delicious. 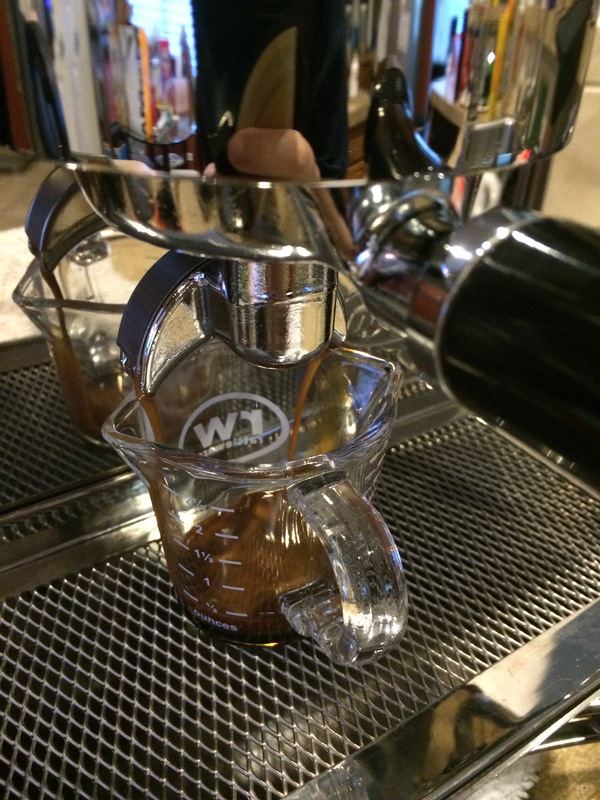 So, how can you experience a “good” shot of espresso? If you’re local to Dallas, come to my house. Seriously. I will make you a shot! The idea of doing an espresso cupping actually sounds like a lot of fun. Hmmmm. Seek out highly regarded coffee shops in your area. I would start with Yelp and also search forums such as CoffeeGeek. 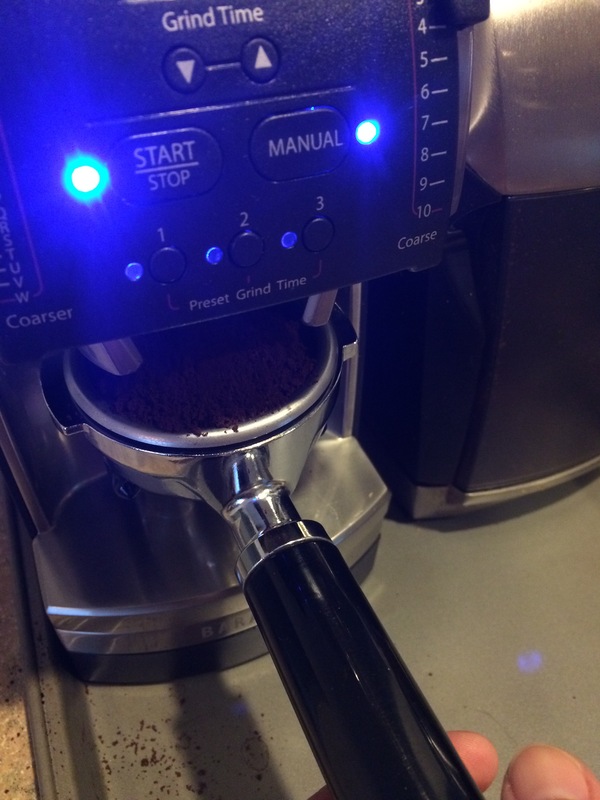 For more information on shopping for an espresso machine (and grinder!!) 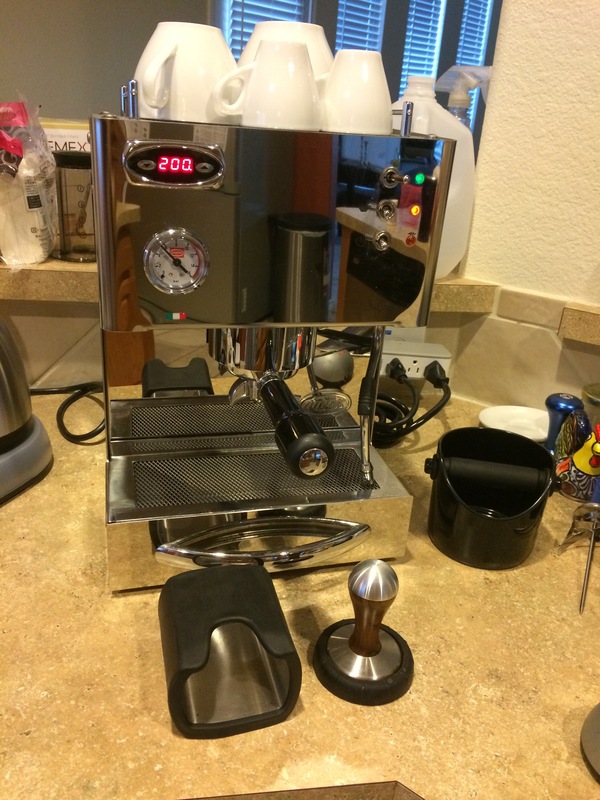 to fit your needs, read up on my posts Espresso machines: the basics and Help! I need a grinder – what should I get? 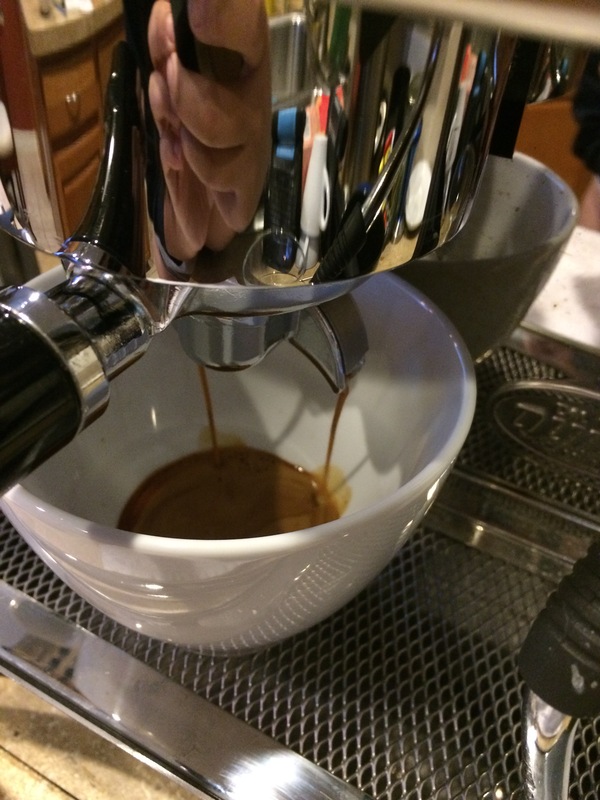 Once you get your hands on some great espresso beans, the only thing left is to practice, practice, practice. What a great intro to espresso, Margaret! 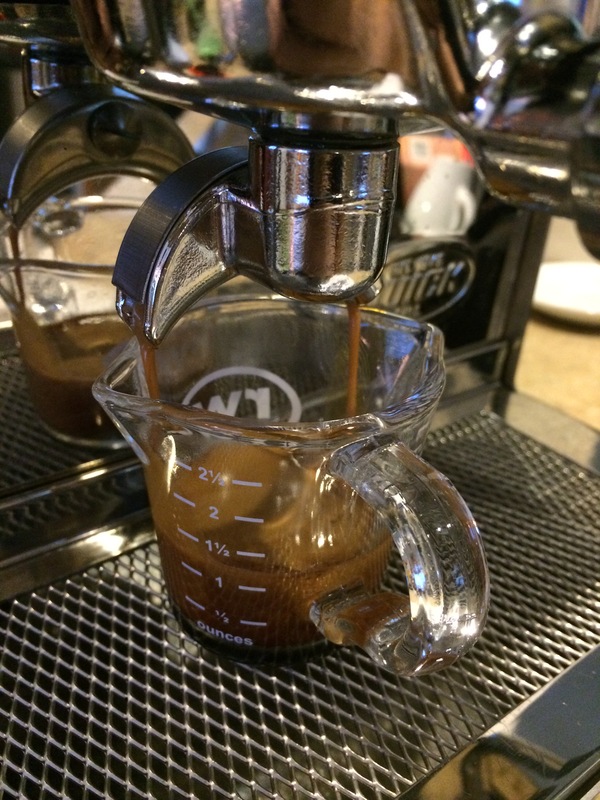 It’s so funny how manufacturers of super-autos and autos use pressurized portafilters to create the illusion of crema (which is one of the visual cues that espresso newbs place way too much emphasis on to determine shot quality). It kind of reminds me of companies putting sodium lauryl sulfate (SLS) in their products, such as toothpaste, to create the illusion of clean with the suds that are created. And people clearly eat it up, because whenever a friend uses my SLS-free toothpaste they complain about how they don’t think it’s cleaning their teeth sufficiently, simply because it lacks this detergent. Anyways, big tangent there. Thanks for this write-up! How funny, I also use SLS-free toothpaste! Hi there!!! I just came across your site when I googled “espresso tastes like cigarettes”. HAHAHA! My husband has just started to learn how to use our DeLonghi espresso/coffee maker, but the espresso tasted like burned cigarettes. I see in your advice above you stated that it is from “pulling” too long. How do you not pull too long? We have only made a couple shots so far, and are very new to this. With our machine you just pour in the water and out comes the espresso in the cup, I am not sure there is an ability to steep it a shorter or longer amount of time?? Any more advice you can give is AMAZING as we are just reading directions from the maker of the machine and trying to go with it. Hi Emily! Can you tell me more about your DeLonghi machine (model name or number)? My advice re: pulling the shot too long applies to semi-automatic machines but it sounds like yours is probably a super-auto or a single-serve machine (does it use pods?). Other reasons for an ashy flavor can possibly be the machine’s water is too hot, or that your beans are roasted too darkly. You probably won’t be able to do much about water temperature, but it might be worth trying a medium roast and seeing what happens. Despite the nomenclature, “espresso roast” isn’t really a thing. 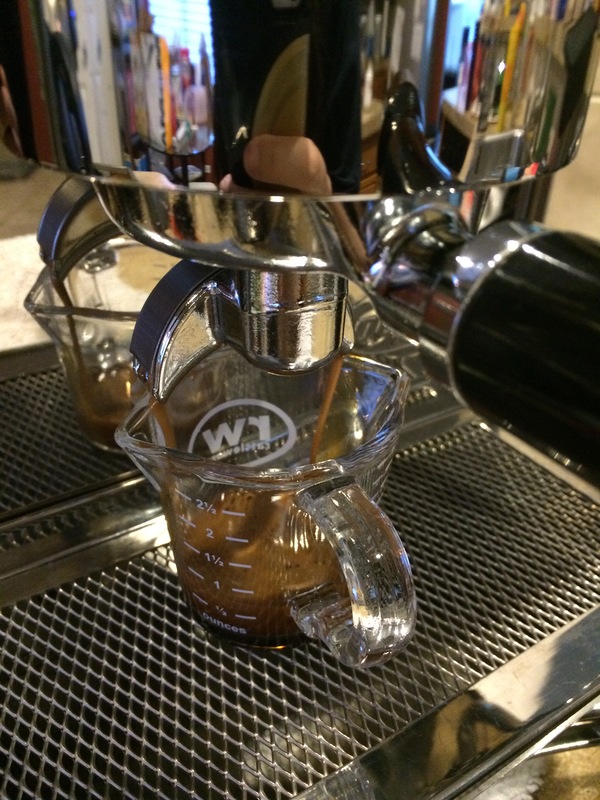 You can make espresso with any coffee; it doesn’t have to be labeled as such. Looking forward to hearing more details! We have this one… DeLonghi BC0330T Combination Drip Coffee and Espresso Machine. We also bought this coffee… (we were clueless about which would be the best one to get), Starbucks Espresso Roast Ground Coffee, Dark. I don’t think we can change the temp on the water. 1) How long does the espresso take to brew? 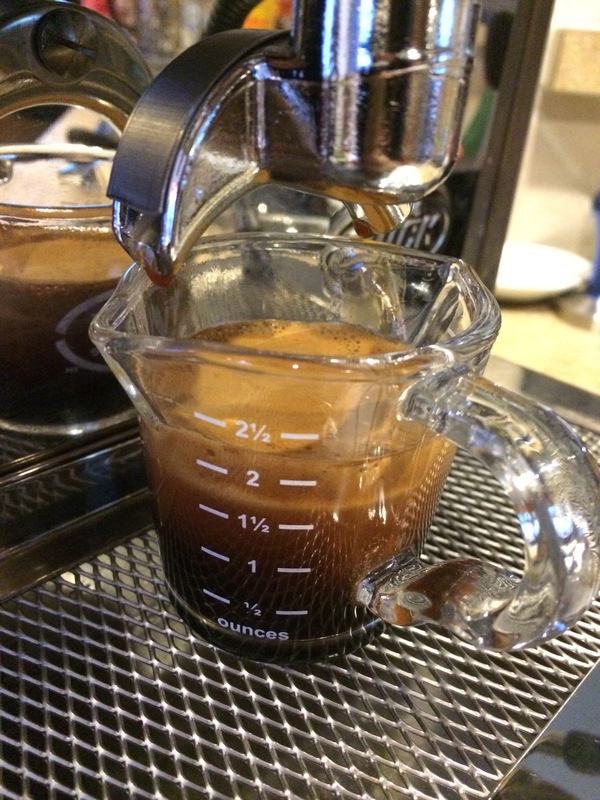 If for example the shot takes 35 seconds from first drip to completion, and you can’t cut off the water flow early, try taking the cup out from under the spout a little earlier (maybe 30 or 25 seconds) and let the last bit go in the drip tray. Taste and see if it’s better. 2) Try a bean that’s not quite so darkly roasted. If you’re sticking to supermarket coffee, try Illy (in the small silver cans), or anything else labeled a medium roast. Let me know what you find out! Best of luck! Will do!!!! We will try these tips and will let you know how it goes. We are starting out with supermarket coffee, but will venture out into the unknown shortly I am sure. I see you are in Dallas… we are in Katy! Some excellent information in this post Margaret! I’m amazed at how you’ve crammed so much into such a short post which is both beginner friendly and also has some info that even the pros often forget!